Like everywhere we have ups and downs in Janwaar – especially when it comes to our learning experiments. What we do, we usually do for the first time and therefore tehre is not much to look around where we can learn from. So failures, feedback loops and a continious adaptation is part of our strategy. The story of Shivrav is such a story. 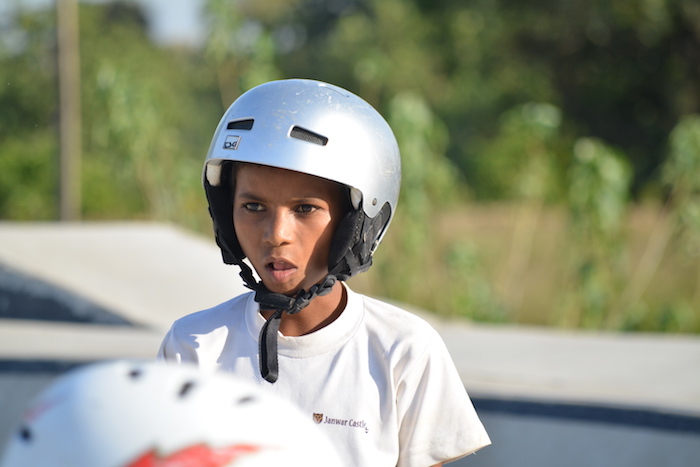 As a Yadav boy who lived right next to it, Shivraj (by then 14 years old) was naturally one of the first kids to come and explore our skatepark. And without any hesitation as though it were his prerogative he took the lead. He quickly developed social skills, shouldered responsibilities and was always ready to step in and moderate when some of the kids started arguments. He gave the skatepark its heart and soul. And over time he really became respected by the other kids – not because he was a a Yadav boy, which would have been the “normal” scenario, but because of the way he acted. In short: he started to flourish and shine. On rare occasions, however, we also experienced him as a troublemaker – teasing the others and somehow exerting his superiority over them. Whenever this happened, we talked to him and he gradually became more and more understanding. But it was exactly his positive “leadership” qualities which convinced me that it would be Shivraj who’d receive the first scholarship we were offered. Together with the Prakriti school in Noida we designed a one-year-learning path – tailored to his capabilities and skills. It was a tough year for Shivraj. Being away from home and all his friends and learning how to learn were nothing he was particularly keen on – even though he embraced his scholarship whole-heartedly. He was constantly torn between the freedom and ease of his village life and his wish to do better. One day when I visited him in Noida he told me: “I feel like I’m in prison here, Ulrike. Nowhere I can go alone. Whatever I do, wherever I wanna go, I have to have someone with me! When I step out of the door, all I see is a very busy street!” Besides learning to cope with city life, his biggest challenge was to focus and put extra time and effort into very basic subjects such as elementary maths, writing and reading. As it turned out, over this year, Shivraj was much more interested in practical things than in academic learning. This was the Shivraj we knew from the skatepark. And this was the Shivraj – bullying, manipulative and duplicitous – we got to know better when he returned to Janwaar. It was obvious that Shivraj was happy to be back in Janwaar. One could see it in his face. But it was equally apparent that things had changed in Janwaar. While Shivraj was gone the kids had chosen another “leader”, Arun, a fifteen year old Adivasi boy. Arun had become a pretty good skateboarder and he was good at school as well. He had grown into this role while Shivraj was gone in the same way that Shivraj had naturally grown out of it – simply because he was no longer present. Perhaps unsurprisingly Shivraj thought he would be reinstated as leader the moment he returned to Janwaar. Reality, though, told a different tale. And this brought out the side of Shivraj which the Prakriti assessment described so well when it talked about his inability to distinguish between right and wrong. He easily lost his temper, and started to fight, he lied and he tried to intimidate Arun by playing the odious “caste-card”. But above all, Shivraj tried to split the skatepark crowd into Yadav and all the rest. He threatened to beat Arun up and he used the most foul language against other Adivasi friends of Arun’s. Everything Shivraj did had one objective – he, was desperately trying to win back his lost leadership role. And in almost every aspect he miserably failed. The months Shivraj spent in Janwaar were like one long rollercoaster ride. In endless conversations we tried to make clear to him what was going on. Sometimes he seemed to understand and accept what we were saying. Sometimes he simply freaked out and threatened and bullied the Adivasi. In the end – instead of heeding what we were saying – he decided that we’d become partisan and taken Arun’s side and started to fight against us as well. So I regretfully banned him from our community center and asked him to reflect on the way he’d been behaving and to apologise to all those he’d been bullying. Over the last year and a half Shivraj still hasn’t found his way to “come back”. He spent quite some time in Mumbai with his elder sister and every time he is returning to Janwaar we can see his good will trying to become part of the kids’ community again – but after a while he starts bullying again. He is insecure and seems almost fragile when he comes to Villa Janwaar while at the same time he is still trying to find bypasses – meaning not changing his behaviour – and “dominating” the kids. Let’s see where all this will go.